This report may be dated and circumstances may have changed to some degree given all of the changes that have occurred in Myanmar since our visit there in 2008. However, it is critical to gather as much information as possible beforehand about issues as mundane as money: credit cards are/aren't accepted? If cash only, then in what denominations and need they be crisp new bills? Is internet available? If not, and you are on a multi-country tour and need to be in touch with your next stops during your time in Myanmar, explore other options for communications -- faxing? phoning? sending messages via the U.S. Embassy? -- or reconcile yourself and your correspondents to silence for the duration of your stay. There was a business center in our hotel but, inconceivable to a Westerner, no internet connections available. Performing in Myanmar is particularly difficult because anything American attracts the negative attention of the military regime. The idea of performing in a theater was ruled out, not only because the theaters would have been in dilapidated condition, but even more so because the Embassy knew from experience that even if they were able to get permission to produce a concert in a theater, the regime would cancel the license within 24 hours of the performance. Similarly, if they hired a ballroom in one of the hotels in Yangon, the regime would likely force the hotel to renege on the contract at the last minute. 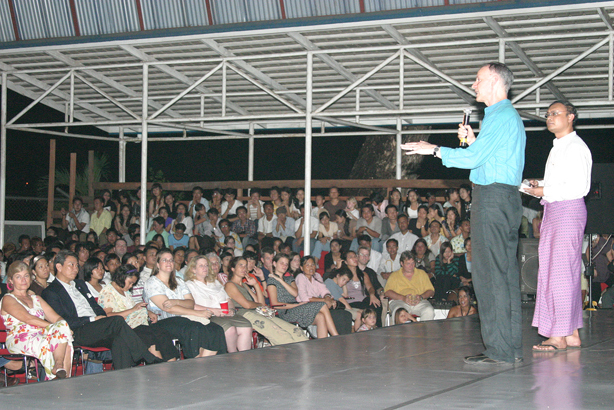 As a result, the Embassy arranged to have a stage built on what is usually a basketball court on the American Embassy's residential compound. The second performance was at the International School of Yangon, a private institution with its own land and heavy subsidies from the U.S. and other Western countries whose children attend the school. We had very low attendance at our workshops, a striking difference from other countries where we often have to add workshops to accommodate the overflow. From the less shy participants, we were able to find out that the 'authorities' had tried to dissuade them from attending, and that many of their friends were worried about braving the massive security at the American Library where the workshops were held; and-or that they were worried about Myanmar's secret service security cameras that they knew would be trained on the Entrance to the Library, keeping tabs on Myanmar citizens who pay too much attention to anything American. It is bittersweet to enter the Business Centre at a 5-star hotel in Yangon only to find out that even there (perhaps especially there) one cannot find internet service. We heard about an internet cafe downtown that supposedly had service. How if no one else did? Because the owner was related to one of the Generals. OK. We went there. Signing onto webmail and downloading messages involved calling over to the young aides who ran from terminal to terminal, dialing in new aliases in order to undermine the government's firewalls. Better be quick -- only one or two sentences could get through before the fox caught the rabbit and the service was terminated. Our primary liaison in Yangon was Nyi Nyi Thu, Cultural Affairs Specialist at the US Embassy. I hope he is still there. Nyi Nyi is a charming, warm-hearted can-do person. I will never forget going with him to find a carpet and flooring store at the marketplace and picking out the most neutral linoleum available with which to cover the stage at the 'basketball court' and haggling over its price. This was the final layer that was to be applied to a stage that had been built from scratch on the court's concrete base. How did they come up with the wooden under-structure? The Water Festival had gone on a week or so earlier and the floats and stages that had been erected for this massive national event were being taken down and Nyi Nyi arranged for the lumber to be reserved for our stage! Given where we were, it was probably teak! The US Embassy organized seating for approximately 750 people at the first performance. More than a thousand came, and those who came too late to get a seat stood on the periphery of the 'basketball court', jammed together as if at a rock concert. The energy was palpable. The audience stayed throughout the 90-minute program, despite the heat, crowds, standing room only, and bugs (which formed a carpet on the stage, attracted to the lights) because they were so hungry for new experience and intellectual and cultural stimulation. In the sweltering heat of the afternoon, 24 carpenters and electricians (most in flip flops or bare feet and dressed in the traditional sarong) labored on the outdoor basketball court of the American Club here in Yangon, building a stage and audience risers out of unfinished teak. Voluminous white fabric came straight from the tailor’s and was hung as a cyclorama. After the stage was leveled and finished off, 1” thick rubber pads were placed on top to bridge the gaps between distressed plywood sheets. But rubber being far too sticky for dancers’ pivots and turns, we headed off with Nyi Nyi Moe Thu to the city center to pick out linoleum for the performance that was to happen the following night. We chose an innocuous white and gray-flecked pattern; nothing like the plain black or dark gray standard for a theatrical performance being available. Why, you might wonder, would all of this effort and expense be necessary? Why couldn’t we load into a theater, or at least a hotel ballroom, where the staging and lights (and a/c) would be on hand? The answer is simple and tragic: Myanmar, being a police state and its rulers being distrustful of any public gatherings, and even more so those that are sponsored by a foreign country supportive of the opposition party, a theater or hotel would most likely have its performance permission revoked moments before the curtain went up. Thus the basketball court on American-owned property (mercifully covered, but not so mercifully open on the sides to the heat and humidity, and insects which formed a crunchy carpet under the stage lights later) was the only venue that was immune from interruption. Funding was solidified, visas were secured and Myanmar was on the schedule, wedged between Laos and Taiwan. Fast forward to the next day: Another shopping trip into the city to purchase pulleys and other hardware needed for the show that evening; and my urgent need to answer dozens of e-mails that had been coming in each day from other Asian posts down the line. The Myanmar government strictly controls internet access and no service was available in the Business Centre at our 5-star international hotel. Nyi Nyi thought that an internet café might be a better bet. And it was. Except that no sooner had a proxy server been located and e-mail messages downloaded, than the service was shut off. Young women employees of the café buzzed from one computer terminal to the other, madly typing in new numbers, and for a minute or so, the connection was good; only to be interrupted again. It seemed like an exasperating game of hide and seek – with the Government’s censors winning: I spent an hour in the café during which time I managed to read only 4 out of 50 current e-mails and was unable to send out anything. Frustrating as it was, I took it as a lesson in understanding the challenges of the populace here – and in such a poverty-stricken, isolated nation, only a tiny elite would ever have the funds to try. This sense of “no chance” was verbalized in the first of two dance workshop we held. The seven dancers who attended were obviously thirsty for information from the outside – they wanted to be dancers but television and internet (!) were their only teachers. Two modern dance master classes gave BDC the opportunity to interact in an intimate setting with a group of young people who are experimenting with modern dance. They said, “we have no chance to learn, because practically no one comes here who can teach us.” An American dance company had not toured Myanmar since Martha Graham and her company in 1974. 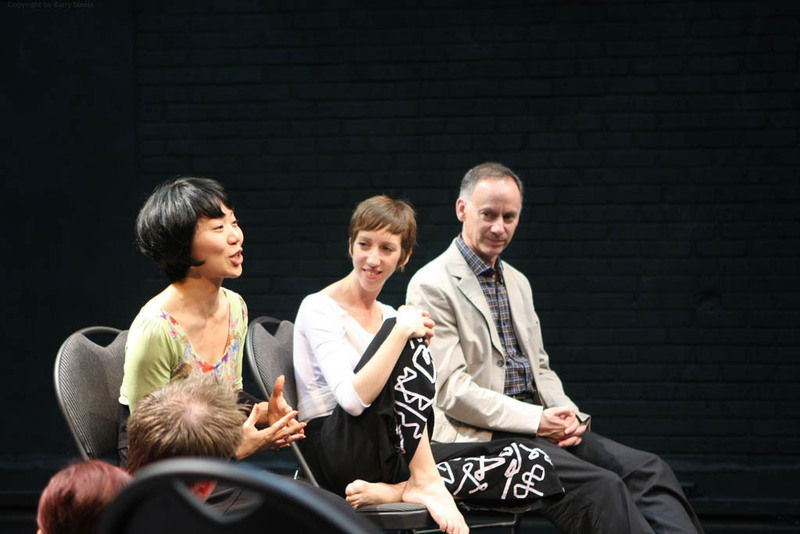 Each and every BDC teaching artist would be more than willing to return, but how? Who would fund such an undertaking? And how could we manage to circumvent the whims of a Government determined to keep its people deaf to the outside world? The night before last was our first of two performances, and despite powerful afternoon rains, the audience arrived in droves. Quickly all the 450 seats were filled and an overflow audience extended into the parking lot. Charge d’Affaires Shari Villarosa gave us a lovely introduction and the show was on. The lighting dazzled the audience, but also attracted a plethora of insect life that gravitated to the linoleum floor. 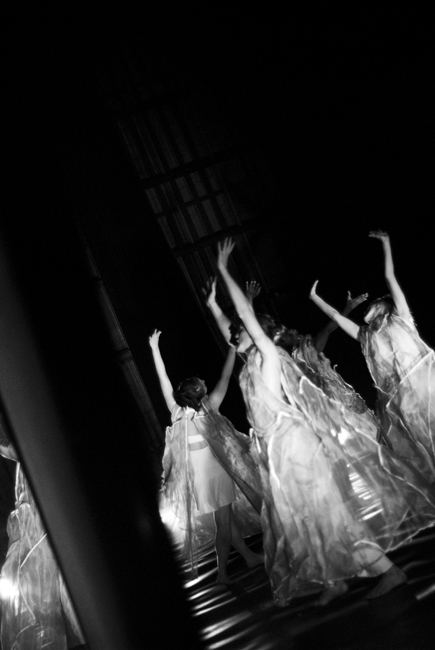 The dancers gamely lost themselves in their performances, jumping high on the custom-built stage and connecting powerfully with the audience. Whoops and hollers and loads of applause rewarded and surprised us. In such a complicated place where people have so much to lose just by attending an American performance, art transcended politics and the spirit was lifted. Battery Dance Company's program in Azerbaijan was nearly cancelled when, two weeks before our departure from New York, the U.S. Embassy conducted a site visit at the theater they had reserved for our performance. That’s when they became aware that the stage was in such bad condition that it was not considered fit for barefoot dancing. However, it was too late from our perspective to cancel: Airlines tickets had been purchased and the Baku program was situated in between Turkey and Armenia on the tour. Cancelling would have left a gaping hole in our itinerary. We convinced the Embassy that we’d find a solution once we arrived in country. Our intrepid production designer came up with a solution that is described in the narrative. It took nerves of steel and determination to press on but the results were well worth it. Battery Dance Company's programs in Baku, Azerbaijan, were groundbreaking in that a visit to this capital city by an American modern dance company was exceedingly rare (none of the dancers or critics whom we met could cite an earlier example). The Company’s performance at the Musical Comedy Theater was packed with a diverse audience, ranging from fur-coated oil magnates and their bejeweled wives to turtle-necked college students. Getting the show up was one of BDC’s biggest challenges to date: the stage surface was cut through by an old-fashioned turntable, separated from the main stage by a gap of up to an inch and not level with the stage. Fortunately, the Public Affairs Officer at the U.S. Embassy and his staff had identified this problem before BDC’s arrival and contingencies were in place. Masonite and packing material were obtained and the entire stage floor was covered and painted. The surface was smooth and therefore safe for the dancers’ bare feet, although it was still somewhat “lumpy”. The performance was covered by national television news as well as the local Baku press. Master classes were excited, over-crowded affairs with large numbers of students and teachers watching from the sidelines. The dance system in Azerbaijan was structured by the Russians and decidedly old school. Modern dance is practically non-existent due more to the lack of qualified teachers than to a lack of interest. Hip hop and show/jazz dance are fascinating to young dancers who have formed a couple of small ensembles to train each other and to perform for cabarets and shows. These dancers appear to have learned whatever they know from MTV and movies and are hungry for “live” instruction. Arrival at the Baku Airport in the early morning hours of Monday: We certainly stood out on from the all-male, black-coated fellow travelers who seemed part of a 1950's black and white movie. The straight-faced customs officials accepted our 8 passports and pre-prepared visa applications, studied them along with the official diplomatic note from the U.S. Embassy and without the slightest hint of a smile, said "no charge" waiving the very substantial visa fees. Wow! What a nice welcome! It seems that performing artists are respected and welcomed in this country. A bevy of reporters gathering in the afternoon on the rooftop of our hotel for a mini-press conference were interested to know if we were aware of Azerbaijan's rich background in folkloric dance and music (we admitted our ignorance in this regard). They hoped that we would have the opportunity of interacting with young dancers and choreographers who had been turned on by the British dance company Random Dance via British Council-funded residencies in 2003, and a Russian modern dance company that had temporarily set up a branch operation here in Baku, only to shut down a short while later. We had the chance with three workshops at the Baku School of Choreography, the University of Arts & Culture, and the Spider Dance Group. After our workshops and the press conference, we all regrouped (and re-groomed) for a reception at U.S. Ambassador Anne Derse's residence. The Ambassador herself was down-to-earth and genuine and when she delivered her welcome speech in Azeri as well as English, the guests (and we) were deeply impressed. THree of us headed off to Azerbaijan's premiere dance conservatory -- about which one can find many entries on the www from 1930's onward. We were surprised to find that our session started off with a press conference -- approximately 15 journalists and TV crews wanted to know what we thought about Azeri dance, and whether there were any established ballet companies in the U.S.! After mentioning NYC Ballet and American Ballet Theater and dropping Balanchine's name without any sign of recognition, I realized that we were "big news" and not the more marginal "cultural news" because certainly, these names would have been familiar to the cultural press. We had prepared material from our repertoire that involved various moves on the floor -- but these had to be quickly modified when we entered the large sunny studio and saw 20 young ballet students in traditional Russian ballet attire (black leotards and white tights for the girls; white t-shirts and black tights for the boys; and pointe shoes or ballet slippers on everybody. More alarming was the condition of the floor -- bleached unfinished boards that were probably perfect for ballet slippers but deadly for either bare feet or the floor moves that had been planned (splinters galore!) The master class began with a series of isolations with ribs and hips, gyrations that caused the students and audience to giggle uproariously. Phrases from the repertoire were doled out in good measure and the kids did their best to keep up. Great fun was had by all and when we wandered out of the room at the end, we encountered students, participants and audience alike, gleefully trying out the choreography in the hallways and staircases and clamoring for autographs. By way of an unplanned post-script to our program, BDC's Artistic Director was asked to lead a workshop for the Neru Dance Group, 7 very talented and hard working dancers who had been mentored by a Russian teacher who closed shop some time ago. They showed their work in the form of a techno ensemble dance, whipped to smooth finish, which they said was in the style of Britney Spears. It was fortunate that they shared their work first, before the master class, because the impression given by the culture journalist who raved about this group was that they were "experimental" and "avant-garde". This was definitely not the case by Western standards, but they were wonderfully open to anything offered and jumped in to the experimentation and self-expression that was asked of them. After 90 minutes, they had concocted a very complex and engaging dance essay and everyone left with warm embraces and promises to meet after the show so that they could be introduced to the BDC dancers. The U.S. Ambassador and Azerbaijan's Minister of Culture were in the audience at the Musical Comedy Theater to attend Battery Dance Company's performance. Equally exciting was the fact that at least one hundred dance students from all of the schools and studios where we had taught were there to cheer us on. BDC members were a little surprised when the TV cameras appeared back stage at intermission asking for interviews. As always, the questioners rolled around to, "What is your impression of Azeri dance? How do you like our country?" After our wonderful interactions in the workshops, our dancers had plenty to say about the passion and determination of Azeri dancers -- too much in fact! They had to be interrupted with a reminder that the audience was awaiting the second act! The miracle of the show, of course, was that it happened at all given what was mentioned previously about the stage floor. Having the flexibility to barter - understanding and activating the concept of quid pro quo in the corporate as well as the non-profit dance sectors -- these are important techniques and strategies in the realm of international touring. 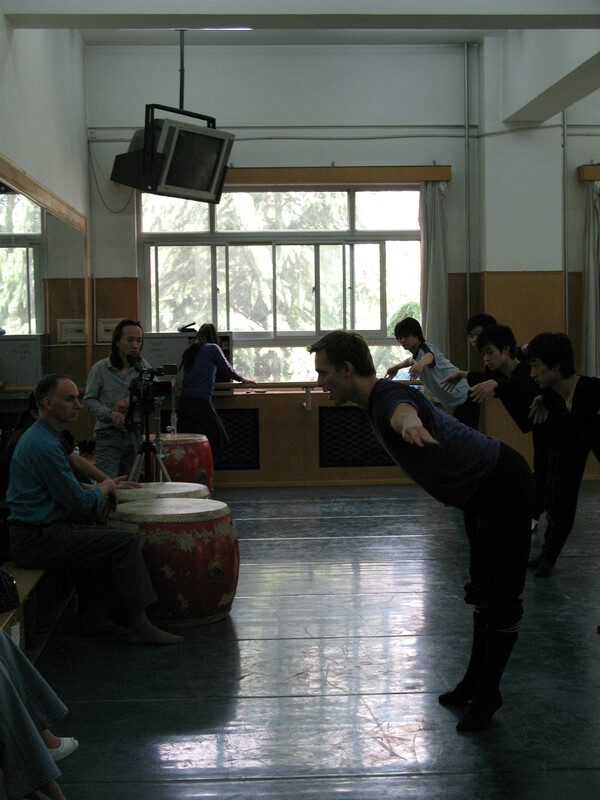 In building our China program, we demonstrated to our local hosts at the Beijing LDTX Dance Company that we were willing and able to reciprocate, in recognition of their generous support. Likewise, when bargaining with our hotel sponsor, we made ourselves available to perform for guests and important clients at a corporate cocktail party. From the moment we landed in Beijing, it's been a jolt into the future: arriving at the newly opened airport: huge, magnificent; checking into the JW Marriott, our hospitality sponsor: sparkling new, palatial yet gracious; meeting Sarabeth Berman and Willy Tsao of the Beijing LDTX Dance Company, our hosts for the First Beijing International Dance Festival: warm, welcoming, and impeccably organized. Over the past 4 days, we've taught two master classes, given a performance on the terrace at the hotel, attended the opening night performance of the Festival presented by the stunning Hong Kong City Contemporary Dance Company (CCDC), indulged in great food while spending time comparing notes with our Chinese colleagues, and tonight is the big night: OUR PERFORMANCE AT THE FESTIVAL! Nerves are running high. Last night's performance at the Tian Qiao Theater was the grand finale of our Asia Tour, and the dancers and Barry held nothing in reserve. Over 1,000 people came out to see what the American dance company was all about, and judging from the ultra sophisticated and very complimentary comments we heard in the audience talk-back session at the end of the performance, they liked what they saw! Viewers told us that they appreciated the musicality of the program, paying special attention to the fact that three out of the four musical scores were composed for us and that the dance and music meshed in a way that "isn't usually seen in China". Two speakers talked about Shell Games and gave their interpretations -- showing that they had excavated deeply into the piece and had mined very rich meaning from it. We were glowing with excitement to be so thoroughly rewarded, especially since it was clear that this was an audience of cognoscenti. Sarabeth Berman, a young American dancer who has taken up residence as Festival Manager for the Beijing LDTX Dance Company, was a complete delight. Though she was stepping out for the first time in her very responsible role, she carried it off with grace and expertise. Willy Tsao, the Johnny Appleseed of modern dance in China (he has established no less than 3 dance companies - in Hong Kong, Guongzhou and Beijing) is a charming and open-minded artist. He made us feel so comfortable and welcome in his home territory. We were very disappointed not to be able to see the Beijing LDTX Company in action -- but hope that we can help them find performance opportunities in New York before long! BDC was warned not to be disappointed if only 300 or so audience members showed up at its performance at the 1100-seat National Cultural Hall in Vientiane. It was said that this was the average turn-out at “foreign embassy-sponsored events”. When asked why, we were told that Laotians believe that these shows are not for them, and that they wouldn’t understand them. Therefore, it was a wonderful surprise to see the hall fill up and to enjoy the rapturous response to Battery Dance Company’s modern dance repertoire. The Interior Minister and his wife hugged the dancers on stage at the end of the performance, particularly thrilled that young Lao hip- hop dancers who had taken part in BDC’s workshops, had been persuaded to perform as a surprise encore in BDC’s show. In a country that has had so little exposure to American culture and which is subject to intense government restrictions such as Laos, it is hard to know in advance how to design a program with maximum impact. We were unprepared for the fact that there were no spaces for the workshops with proper flooring and had to make do with cement. I'm not sure what to say about this. We are categorically opposed to putting our dancers and participants at risk, which is definitely the case on cement; however, if we'd said "no", then the resonance of our program would have been dampered, not only through the loss of workshops that reached many young people; but their subsequent appearance on stage at our performance which served to endear us to the local officials and the audience alike. Starting our 4-day program in Laos, we acclimated to the 3 H's - hazy, hot and humid. We're New Yorkers after all, so this is familiar to us though slightly out of season. A great Lao meal on the first night following a day of recreation, shopping and theater reconnoitering (Barry and me) on our first day off since April 11 helped to restore us. Even more so, the delightful manners of the Lao people reinforced our feeling of being welcome in this beautiful country. This morning, we were introduced to 30+ young dancers and singers, members of several dance groups here, who jumped into Carmen's modern dance master class and will join Sean in hip-hopping this afternoon. A huge air-conditioned hall was arranged for the classes, complete with great sound system, mirrors but, unfortunately, a cement floor. Carmen modified her class (no jumps!) and off they went with abandon and excitement to learn some new techniques. Apparently, we are the first professional American dancers they've met, and their enthusiasm showed! Last night's performance was a stand-out for the Company. We filled the orchestra of the National Cultural Hall -- 920 people strong -- with a large proportion of young people who rewarded us with a tremendously resonant response. Laos is a relatively isolated country, the least Westernized in Asia that we've seen. And yet the audience clearly followed all of the action on stage and gave back so tangibly with laughs, gasps and applause. The dancers responded in kind and raised their performance to the very top notch. We were deeply touched by Ambassador Ravic Huso's effusive praise at the end. We'd met him earlier in the week, and he'd promised an honest assessment; and given his no- nonsense delivery, we understood him to mean it! Laos' Vice Minister of Information and Culture Mr. Bouangeun and his wife were also charming on the stage -- with a little English and a lot of hand gestures, they made it clear that they loved the performance and hope we'll return soon. We're sad that our short stay here is over and hope this isn't the end of our contact with Laos! Working with Amy Archibald, the APAO here, and her delightful and talented staffer Sengsouriya has been a treat. A special thanks also to our driver Sengthavy whose smile and guidance were welcome throughout! Timing: The scheduling of a program can be extremely tricky, given all of the aspects that need to be considered, some of which are entirely out of your control. Case in point -- our project in Mongolia. We had to juggle the puzzle pieces of a 6-country regional tour in which some of the pieces were locked into place early, and others had to be fit in as the logic of flight itineraries, budgets, availability of venues and coordination with local host institutions necessitated. The Mongolia program was short because it had to be shoe-horned between the Taiwan and China programs that were tied to specific dates. However, it ended up being notable for the big impact of our performance at the opera house (which was televised nationally), our easy affinity and sharing with the Arts Council of Mongolia, and our master classes at the conservatories. We would have liked to interact much more intensively with the local professional dancers; however, their tour and performance schedule clashed with our dates, so we only had one very brief master class. Technical Issues: As reported in the narrative, the opera house stage was in very bad condition; likewise, the lighting equipment and soft goods. Only because our technical director Barry Steele was inventive and had a positive can-do attitude which was matched by our liaisons at the US Embassy and the Arts Council of Mongolia, were we able to perform. The value of these qualities -- optimism, we-will-overcome (all challenges), and resourcefulness/inventiveness cannot be overstated. Upon arriving in Mongolia, we had to attend to the mundane business of a dance company on tour: Laundering costumes and exchanging money. 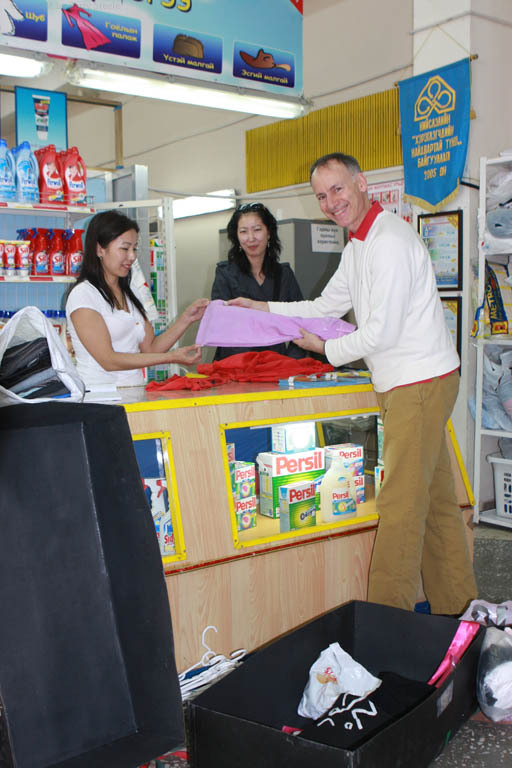 In the first instance, we were astonished to find Metro Laundry, a giant establishment buzzing with workers, washing machines and every possible detergent known to mankind (mostly imported from Germany where I know from experience one can find great quality stain removers, cold water washes, etc.) Having unloaded a bundle at Metro, we headed to the bank where we were relieved to find tellers and ATM's on a Saturday who were able to change money for us and deliver the clean crisp bills that we will need on Monday morning when we apply (for the 4th time) for our Chinese visas. Check back later to see how that story unfolds...! 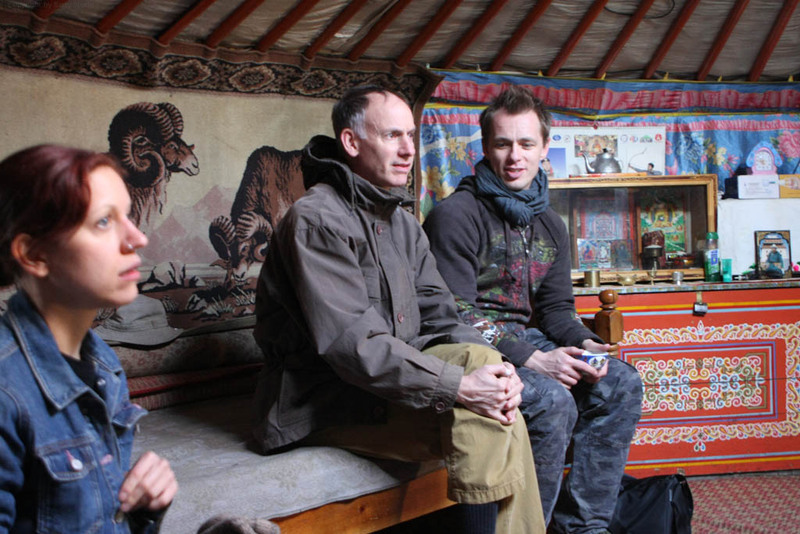 It was time for our trip to Terelj, accompanied by Nomi and Monki from the Arts Council of Mongolia. A former contortionist who performed with Cirque de Soleil, Nomi has made a seamless transition into an expert arts manager, and as we found out, a fun tour guide. Monki is a former teacher and museum curator who has recently joined the Arts Council. 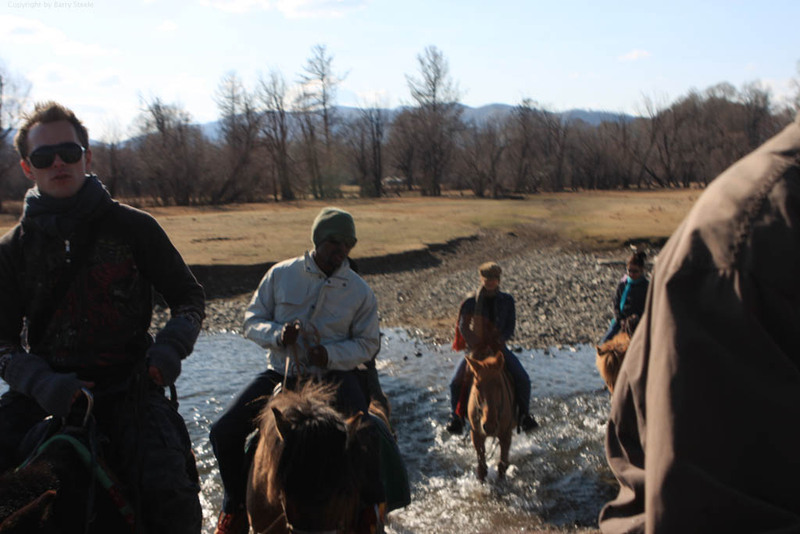 After a delicious lunch of local specialties in a country inn, we mounted pint-sized, furry Mongolian horses (never mind that the stirrups were too short) and enjoyed a two hour jaunt into the wilderness. The hills were dusted with pale green, a hint of the grass that will eventually coat them. All in all, this was a cleansing and amazing real-life geography lesson and fascinating introduction to a country that is neither Asia nor Europe, but something in between and unto itself. 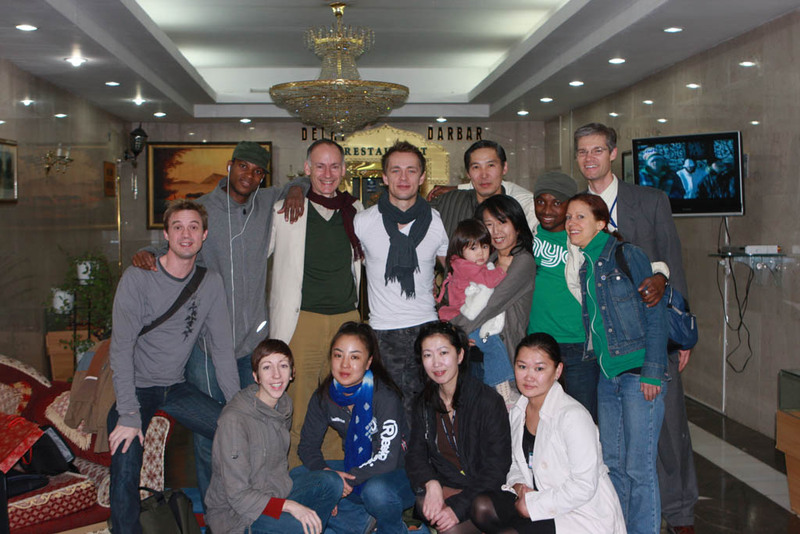 We feel incredibly privileged to be the first American dance company to perform in Ulaanbaatar (according to Nomi). Again a multi-layered day with the Company split up into groups who fanned out across this city of the Steppes to teach, meet/greet, and learn about contemporary art and folkloric dance and music of Mongolia. The streets were dusted with snow this morning as we left for our various assignments: Sean, Carmen and I went to the College of Music and Dance where we were first treated to a performance of classical ballet, followed by an exquisite Mongolian folk dance and finally the first modern dance choreography essayed by the school. Following the terrific showing by the students, Carmen took the helm and taught a hard-core modern dance class to which the students responded gamely. Standing in parallel position (after having learned for years to be turned out) was a struggle, but they managed it and followed Carmen's lead through some twisting, turning and other modern moves. Sean raved about their response to hip-hop. I left early to join Barry at the theater where we packed the costumes and tech equipment, inspiring mirth among the wardrobe ladies whose haunt we occupied back stage. I don't think they'd ever seen a man folding and packing garments before. Bafana & Mayuna headed off to the University of Arts & Culture to teach a modern dance workshop and see a demonstration by the dance students; A fabulous lunch at the new Black Pearl, hosted by Alexei Kral, our gracious Public Affairs Officer here, set us up for an afternoon schedule that included a meeting with two dozen bubbly 16-year-olds at the Educational Advising Resource Center. These kids, who have been learning English in a special after-school program twice a week, had lots of wonderful questions about New York, and comments to share about our performance last night -- wow! Perhaps Mongolia is breeding some dance critics and writers to help support the budding dance scene! After some cashmere shopping (! ), we finished off the day at the Saran Chuluu traditional song and dance ensemble performance. A group of 25 musicians and an equal number of dancers, sporting elaborate folk costumes, took us through a crash course in Mongolia's very rich performing arts traditions, including the famous throat singing and plenty more. We met some of the performers after the show and congratulated them on their superb show. Our show at the State Opera House this evening in Ulaanbaatar, Mongolia, was a great surprise -- with a minimum of time and a maximum of human effort and mind-over-matter visioning, Barry (lighting) and the dancers managed to pull off an extraordinarily professional lookingshow. The underseams that no-one saw were almost as compelling as the staged show: 1) the 60+ cardboard boxes, flattened and taped together (purchased by Otgon and me on the Q.T. from the workers at the State Department Store) that formed the under-flooring covered by old, distressed linoleum covering. This cardboard layer served to mitigate the impact on the dancers balance and confidence of the "undulating" wooden stage floor that has seen quite a few too many heavy opera productions 2) the disruption of the dancers' preparation time on stage due to the need to make an appearance at the Chinese Embassy to obtain visas for our arrival two days hence... We'd been turned down 4 times earlier, and dared not cause any ripples since, with the Embassy closed tomorrow, and our departure time on Wednesday being 9 a.m., this was "it". 3) the seriously, sadly under-equipped Opera House where the lighting structures and instruments appeared to have been installed along with the gouged wooden floor in 1942... Luckily, art transcends practical problems; all of us wanted to do our best for the Mongolian audience, and at 1:15 a.m., before crashing, I can honestly say that we outdid ourselves. 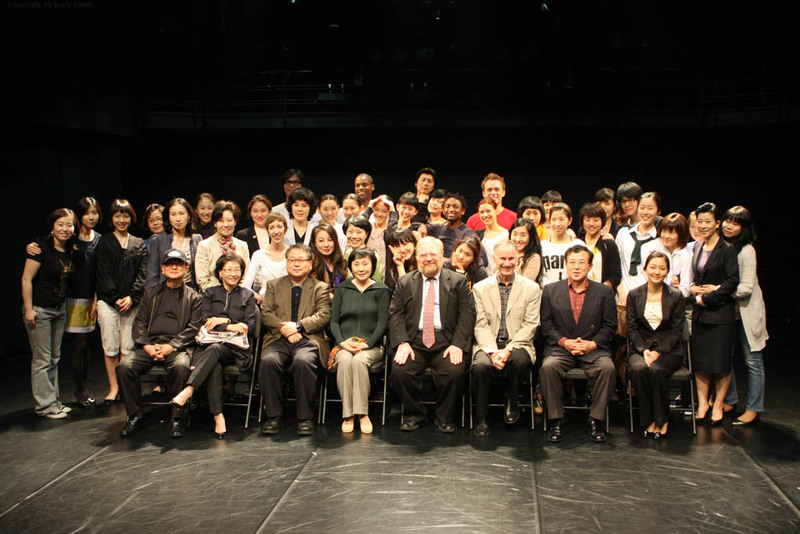 Bringing a dance program to a country with such highly accomplished dancers and dance training institutions as South Korea requires special attention. You don't want to feel that you are bringing "coals to Newcastle", being redundant, and certainly not arrogant. On the other hand, it was truly surprising for us to hear our Korean counterparts complaining that American dance has been absent from the scene in Korea for a dozen years, having been so pivotal and inspiring in earlier times. As such, we felt very much appreciated and that our decision to pitch to a high level for our master classes and performances was the right decision. Suzanne Weil (who went on to run the dance program of the National Endowment for the Arts) it was pure bliss because everything ran like clockwork. Taking a cue from Twyla, we've got to title a piece "Dae-young's Wing", because we were certainly under Kim Dae-young's in Busan! How can it be that we could have had innumerable meetings, logged in many kilometers shuttling between three different venues, run a half-dozen master classes, meetings and interactions, dealt with a 13-hour time difference and 20+ hours of traveling and simultaneously felt like we were on vacation? We came into contact with wonderfully open and receptive dance teachers at Kyungsung University, Dong A University and Busan Arts High School and their talented charges -- all 150 of them who took part in 4 master classes taught on one day (a BDC specialty, since each of the dancers is a teaching artist as well!). The first performance of this year’s Asia Tour was exhilarating. Barry Steele, BDC’s great production designer, worked like a fiend in the theater, ably supported by John Lee and Kim Chi-young and a crew whom he said was one of the finest he has encountered on tour. If you were a dancer or dance student in the 18-24 age range in Busan, our performance at Kyungsung University's very nice auditorium was evidently the place-to-be on Tuesday evening! I was amazed as the crowd flooded into the auditorium to see such a young audience. Obviously the master classes were the best possible marketing tool since it seemed as if, of the 150 or so students who took part in the classes, maybe 149 showed up to our performance?! Given the young crowd, I assumed that "I'll Take You There", with its goofy cartoonish style would be the hit of the evening. Not so. The fans waiting outside the dancers' dressing rooms after the show told me that "Notebooks" was their favorite. Later, at the reception, I heard a lot of buzz around "Shell Games"; and at breakfast the next morning, Mayuna told me that she heard "Moonbeam" praised for its purity. My conclusion: a varied repertoire travels well! It is interesting how I always find myself drawn to the beauty of Asian countries, their food, traditions and their way of living. There is something pure, completely real and precious in the soil here. As we are leaving South Korea, a country that I visited for the first time (and hopefully not last), I am left with much to remember. Most importantly, I am both personally and professionally inspired. Though both performances were received with great audience reviews, the true highlights of our stay here in Korea were (was it 12?) 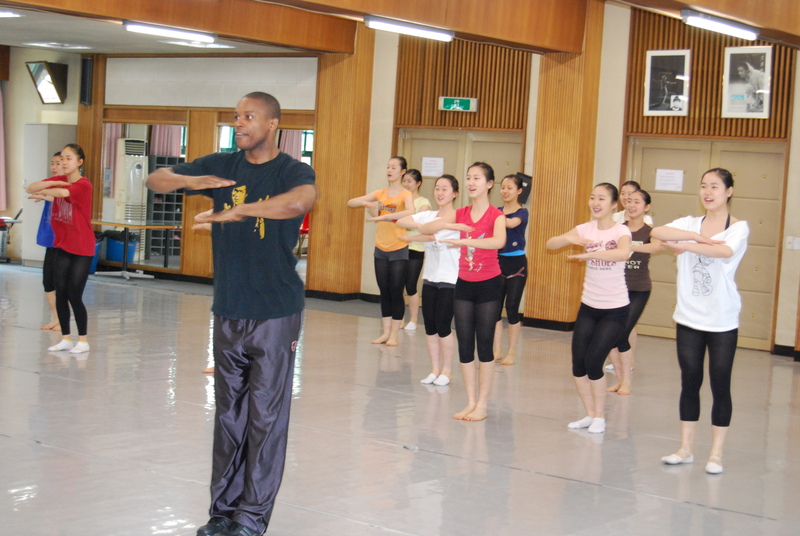 Master classes taught by members of the Company. I was most impressed by the openness, artistic hunger and ability of the students in both Arts High Schools in Busan and Seoul as well as the Universities where we taught. I can say that with all of my extensive international teaching experiences, I have never been so impressed by the talent of the students as well as the work done. It leaves me wondering how much more could be accomplished, if we could only stay longer… Or return soon! I must thank the American Embassy and its staff for understanding the true value and importance of such cultural exchange. But this should be just the beginning. Let’s not be satisfied with what has been done here, pat ourselves on the shoulder for what we’ve done, but rather start building a cultural bridge with constant exchange. Battery Dance Company worked and performed her in 2008. There is usually 'favorite' performances amongst audiences on International tours. However in Busan, there were several favorites in the varied repertoire that BDC presented at the Kyungsung University Auditorium. This lesson has proved valuable in future tours. Once upon a time, one of my mentors, Twyla Tharp, named a piece "Sue's Leg". She said that every time her company toured in the Mid-West and hit the territory that was covered by Suzanne Weil (who went on to run the dance program of the National Endowment for the Arts) it was pure bliss because everything ran like clockwork. Taking a cue from Twyla, we've got to title a piece "Dae-young's Wing", because we were certainly under Kim Dae-young's in Busan! How can it be that we could have had innumerable meetings, logged in many kilometers shuttling between three different venues, run a half-dozen master classes, meetings and interactions, dealt with a 13-hour time difference and 20+ hours of traveling and simultaneously felt like we were on vacation? 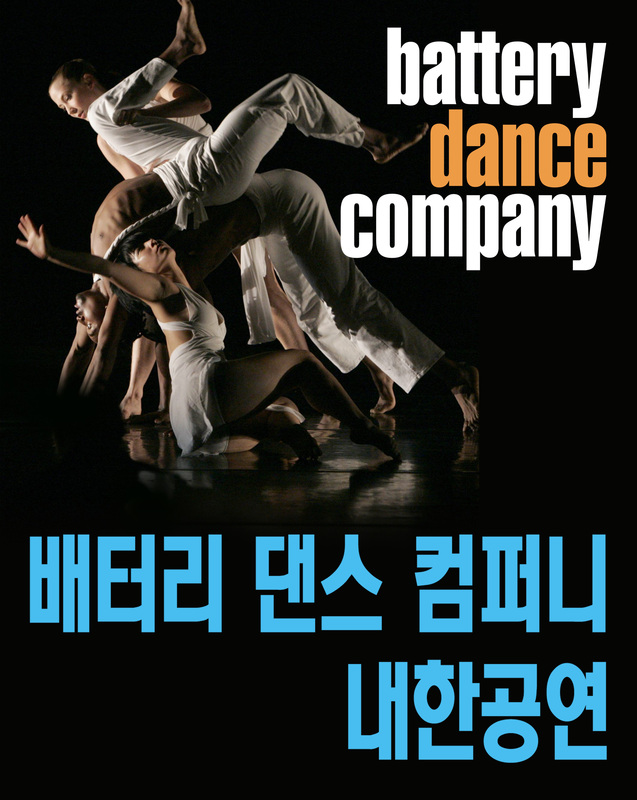 We came into contact with wonderfully open and receptive dance teachers at Kyungsung University, Dong A University and Busan Arts High School and their talented charges -- all 150 of them who took part in 4 master classes taught on one day (a BDC specialty, since each of the dancers is a teaching artist as well!). The first performance of this year’s Asia Tour was exhilarating. Barry Steele, BDC’s great production designer, worked like a fiend in the theater, ably supported by John Lee and Kim Chi-young and a crew whom he said was one of the finest he has encountered on tour. 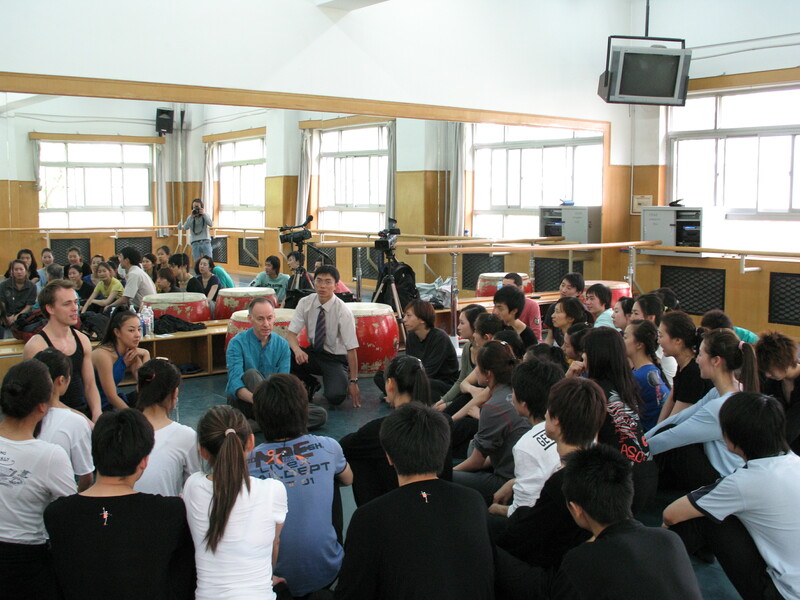 Following are Jonathan Hollander's personal notes from the April 27 – May 2 2008 Battery Dance trip to Taiwan which included intensive workshops for four days with local dancers, one gala performance, one professional artists’ dialogue, and eight master classes. 1 Professional Artists’ Dialogue "Professional Dialogue in Arts Management"
In the case of Taiwan, we were familiar with the Country, its extremely accomplished professional dance scene (and Taiwanese dancers who had performed with Battery Dance Company in New York and on tour), and with our partners at the American Institute in Taiwan and Taipei Artists Village. The Taiwan program, which in retrospect seems more program-heavy than I could have imagined, was only possible because we had worked with Nick Papp in Taiwan in a previous tour (see 2006 report) and as a result, he knew our capacity, we had easy and very direct communication, and we spent a great deal of time on the phone, SKYPE and e-mail leading up to the project, working very much as a harmonious team. For the past two days, we've been on a magic carpet ride here in Taiwan, with a dozen activities accomplished over 48 hours in two cities! The miraculous part is that each event, from a press conference to a Dancing to Connect workshop, has seemed beautifully planned, expertly executed and utterly gratifying! Nick Papp is the Ali Baba who has kept the carpet afloat. He's the CAO here, and with leadership of PAO Thomas Hodges and supported by a bevy of dynamic staff members, he has envisioned a full-on program that will surely have memorable impact in Taipei and Taichung alike. On Monday, in Taipei, the highlight was a "Professional Dialogue in Arts Management" at the illustrious Taipei Artist Village, moderated by Yao-Hua Su, TAV's brilliant Executive Director. My fellow panelists were equally brilliant: Becky Cho, Executive Director of the Taishin Bank Foundation for Arts and Culture and Wen-wen Yeh, Executive of Cloud Gate Dance Theatre. For two hours, we shared our experiences and visions with an audience that included a sparkling array of interested people from the arts, corporate, government and foundation sectors. I like to think that the artists who attended were given some helpful guidance as they pursue the uphill path of attracting support for their work and making the most of what resources they have. Another two 12-hour days replete with inspiration and testing of limits. We continued on four parallel tracks, Mayuna and Tadej journeyed out to two schools in the Taichung region, teaching modern dance master classes. Today, they were surprised by the presence of 50 "observers" in addition to the 20 active participants and delighted by the request that they tack on a professional development session for a group of teachers following the class. Robin and Sean and I took the High Speed Rail with Nick and Su Lee to Kaohsiung. After a drive up into the mountains, we arrived at the Indigenous Peoples' Park to see a brilliant performance of music and dance representative of the 14 tribes of Aboriginal Taiwanese. After a great lunch of Aboriginal specialties, Robin and Sean taught a master class for the same dancers who had performed for us (and 1,000 tourists who had elicited absolutely no response to the phenomenal performance...?!) It was deeply touching to experience the exchange of cultures amongst us throughout the day. Carmen and Bafana spent a total of 16 hours working with 20 junior high school students at the Szu Chen school. I was lucky to attend the beginning of their Dancing to Connect workshop, and to witness the end of it this evening. All of us were astonished and moved by the creativity of the students and can't wait to hear the audience's response tomorrow night when we will all perform together on the huge and beautiful stage at the Chung Shan Hall. 1,600 tickets have already been claimed and we are expecting an overflow crowd. Today in Taichung, we had a three-fold program: a well-attended press conference including a performance for the TV and print media cameras by Sean and Robin; a full-day workshop with twenty talented students at Szu Chen Junior High School led by Carmen and Bafana; and a master class at Wen-Hua Senior High School by Tadej and Mayuna kept the Company busy as they fanned out across the City. Fifteen-hundred or more people filled the Chung Shan Hall this evening. They were drawn to the theater to welcome a dance company that had traveled all the way from New York; but they were also there to celebrate their own: 20 junior high school students from Aboriginal Tribes of Taiwan whose stunning performances brought many tears to eyes (including mine). Performers can feel an audience -- and the Battery Dancers outdid themselves this evening as did the students. I found myself sitting in the theater in amazement, asking myself, "how could they be so self-assured after such a short period of rehearsal?" As moving was the performance, the scene backstage after the concert was even more-so: the students were so pumped up after the show that they didn't want the evening to end. In traditional Aboriginal style, they grabbed the hands of the exhausted Battery Dancers, and we all continued dancing and chanting for another 5 or 10 minutes after the curtain went down. In my 33 years in the theater, this was a first! And I hope it isn't the last! Battery Dance Company worked her in June - July 2008. 1 Dancing to Connect Program with local schools. 2 Sold Out Performances at the Theater Freiburg. Battery Dance Company arrived in Freiburg, the third city of BDC's German odyssey, and this small City/large town was, of course, a singular experience for us. Dancing to Connect was born here out of BDC's 2006 project in Germany, and thus we wereworking with local partners who know us well. Alfred Rogoll was our Project Manager; Wolfgang Borchardt coordinated the schools (8 schools in total) and Eva Manske and the Carl-Schurz-Haus provided the project´s institutional auspices. Before the program began, the company gathered at the Carl-Schurz-Haus with the teachers who are serving as liaisons with each school. We also met with the 9 so-called "veterans" who are our teaching assistants this year. The veterans are senior students, and some graduates, of the Kepler-Gymnasium who had participated in past Dancing to Connect projects in Freiburg. The students were so mature, responsible and talented that BDC asked them to take a step up into the position of student mentors for the younger first-timers. 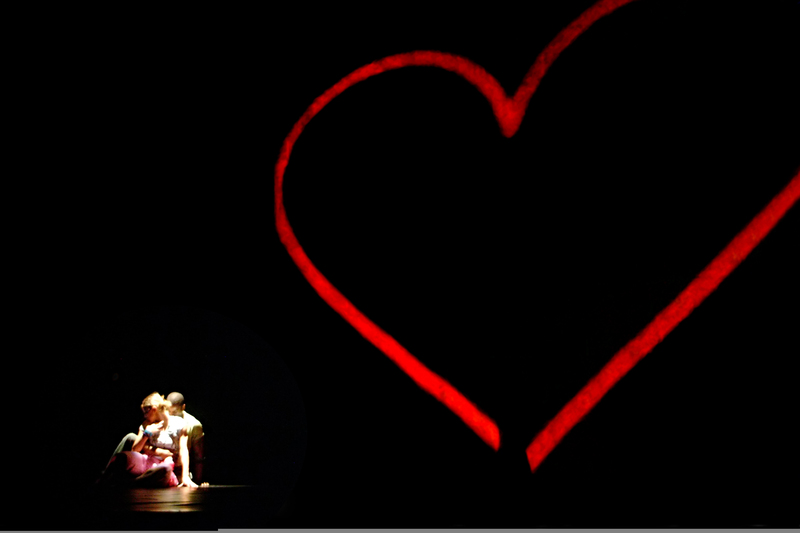 The finale of the theater season in Freiburg was marked by two sold-out performances in the Theater Freiburg, home and gracious host to the 2007 edition of Dancing to Connect. Consul General Jo Ellen Powell provided a warm welcome to the audience as she had done the previous year, also coming back stage to great the nervous performers as they readied themselves before the show. These illustrious occasions, combining the fascinating spectacle of teens unlocking their creativity with the verve of top-class professionals from New York City served as a wonderful tribute to the Dancing to Connect participants, their schools and sponsoring organizations. Dancing to Connect in Freiburg 2008. 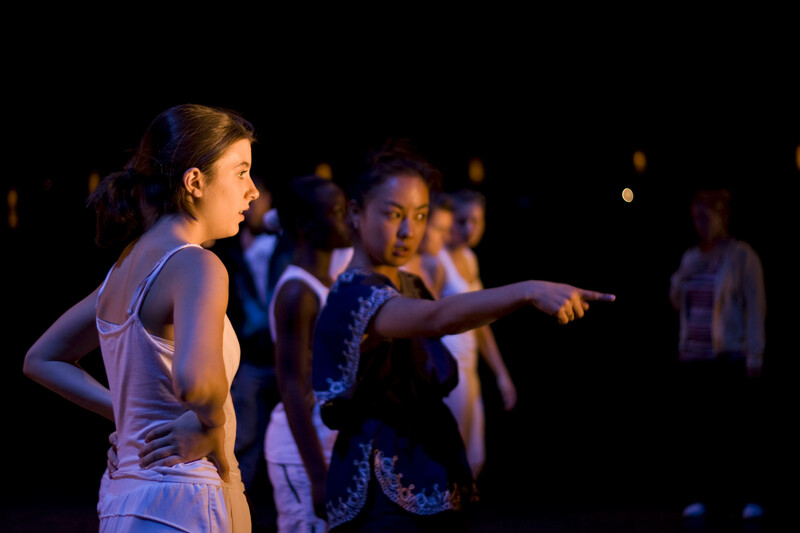 Battery Dance Company worked June - July 2008. 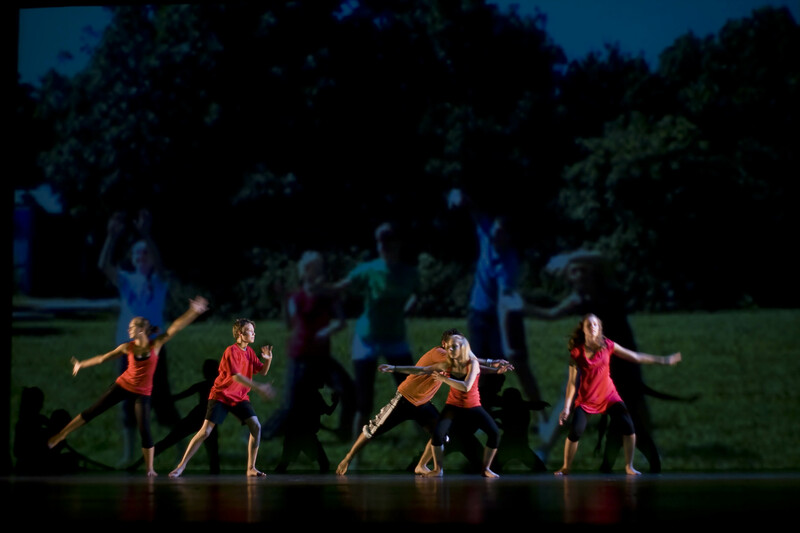 1 *Dancing to Connect Performance as part of the American Days Festival at the Wilhelma Theatre, Stuttgart. In Stuttgart, BDC dancer Robin Cantrell led the German-American Dance-Workshop “Dancing to Connect” at the Untertürkheimer Luginsland School. Collectively with the American professional dancers the students choreograph a dance themselves. They will be performing this dance at the opening event of “American Days” on June, 26 2008 in the Wilhelma Theater for invited guests. According to Friederike Schulte, the Program Specialist at the German-American Center in Stuttgart, approximately 15 Stuttgart schools applied for this project in March. During the selection process it was valued that all school types are represented. For 6 days 7th and 9th grade students from the Luginsland School have rehearsed for their big day. Therefore they train 5 hours daily in the gymnasium. Communication problems between the students and English speaking dance instructors only existed on the first day. When Robin Cantrell described communication with the students, she said: ”Dancing is movement, it is a language through movement”. In an emergency or if necessary one of the teachers jumps in as a translator. Initially the dance instructor explained that the students were scared to mess up when learning a new dance step. 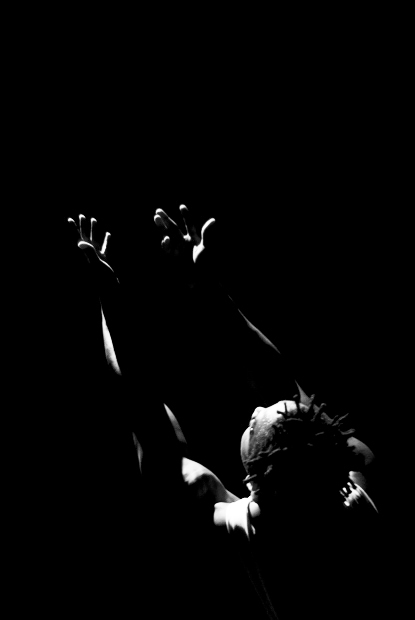 That is what modern dance is all about, creatively expressing oneself. The instructors simply advised the students to simulate the movements of a soccer player or of feelings. The translation of a dance movement is alone the student’s job. Ninth grade student Vera Cristina Monteiro da Silva thought it was great that the students were allowed to actively participate in the choreography of the dances. “This is how school should always be”, stated the enthusiastic Detlef Schmidt-Glöckler, principal of Luginsland School. 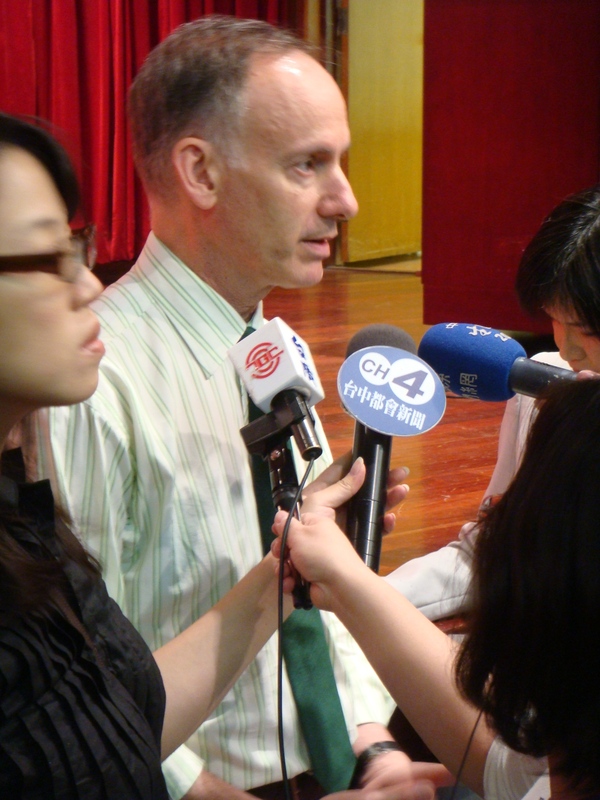 He has always hoped that his students could make positive news some day. Through the dance project “Dancing to Connect” his wish should be fulfilled. The Opening of the American Days Festival in Stuttgart was celebrated through two full-house performances at the historic Wilhelma Theater. Various dignitaries spoke to the audience prior to the performance including the Lord Mayor of Stuttgart and Consul General Jo Ellen Powell, who pleased the crowd by speaking in German as well as in English. The Company had the opportunity of performing for an auditorium packed with university students at the Selcuk University in Konya. 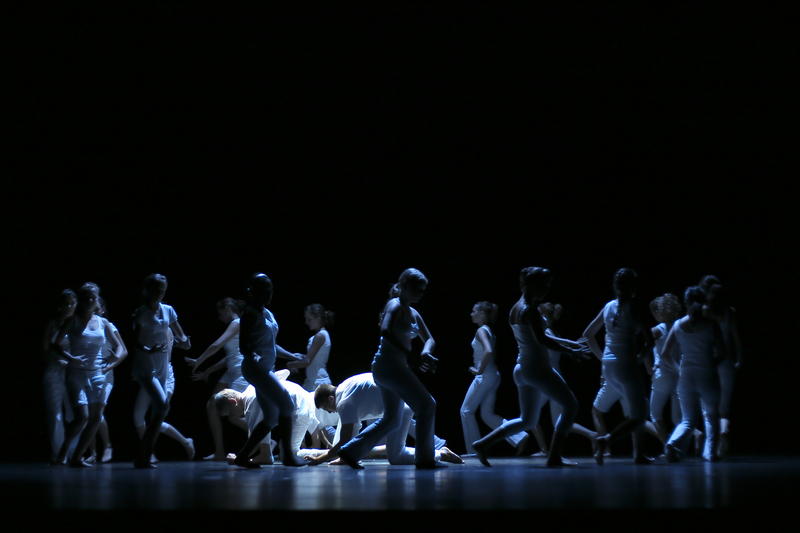 This concert of American modern dance was most likely the first such experience in Konya. It was also the first theatrical performance staged in the auditorium of the newly-built Dilek Sabanci Music Conservatory. The Company gained an understanding of the fracture between secularists and Islamists that divides Turkish society at the performance in Konya. The head of the Music Conservatory is a secularist, and bridled at BDC’s intention to dedicate one of the works on its concert program to Ahmet Calisir, leader of the Mystical Musicians and Whirling Dervishes who had been the liaison and catalyst for BDC’s programs in Konya. The Company had the opportunity of performing for an auditorium packed with university students at the Selcuk University in Konya. 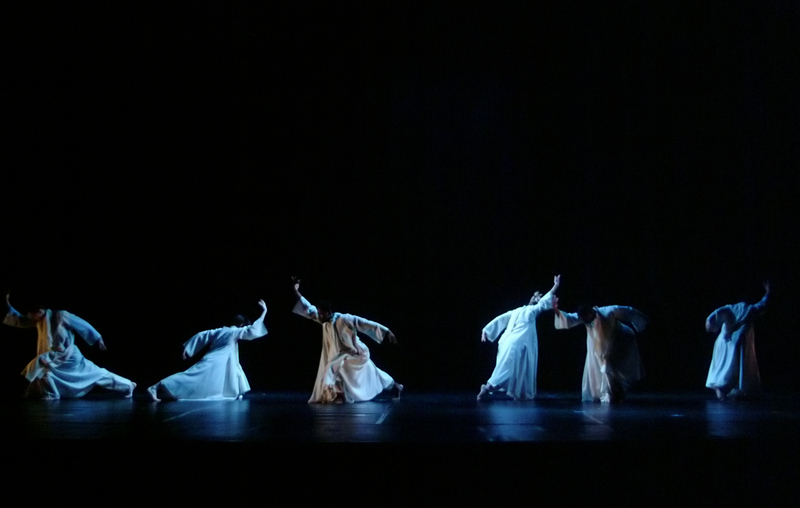 This concert of American modern dance was most likely the first such experience in Konya. It was also the first theatrical performance staged in the auditorium of the newly-built Dilek Sabanci Music Conservatory. The Company gained an understanding of the fracture between secularists and Islamists that divides Turkish society at the performance in Konya. The head of the Music Conservatory is a secularist, and bridled at BDC’s intention to dedicate one of the works on its concert program to Ahmet Calisir, leader of the Mystical Musicians and Whirling Dervishes who had been the liaison and catalyst for BDC’s programs in Konya. 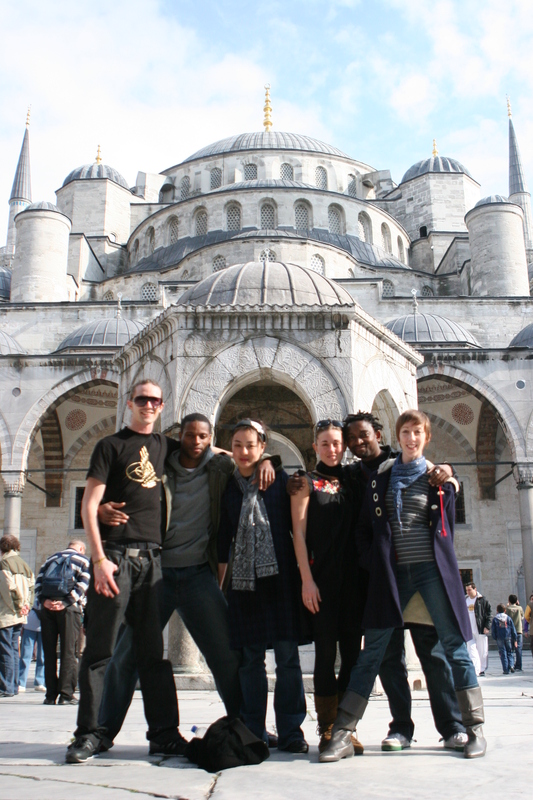 An extensive series of meetings and workshops with Mr. Calisir resulted in the building of mutual respect and trust and has led to the development of plans for a new joint production that Calisir intends to propose for inclusion in the Istanbul 2010 European Capital of Culture Festival. Ahmet Calisir is the human portal through whom knowledge and experience of the whirling dervishes of Konya, the music and the philosophy of 12th Century Sufi poet Rumi may be accessed. My first meeting with Ahmet took place at his office in the center of this coal smoke and fog filled city. Thank goodness for Aysegul Taskin, the cultural assistant from the U.S. Embassy Ankara who accompanied me to this meeting. Her seamless translation made communication with Ahmet fluid. Greetings with kisses on both cheeks are customary in this part of the world; and the exchange of gifts an essential politeness. A spice cake purchased on the run at Paris' Charles de Gaulle Aeroport was well received, but seemed a meager token next to the gorgeous 6-volume collection of Rumi's poetry that Ahmet proffered. Exchanging information about our daughters (we both have two in their challenging teen years!) and our early introduction to music and philosophy. My concert-pianist mother allowed me to start piano lessons at the age of five; Ahmet had memorized the Koran by age 12, helped establish a bond of brotherliness that only continued to grow as we learned more about each other. 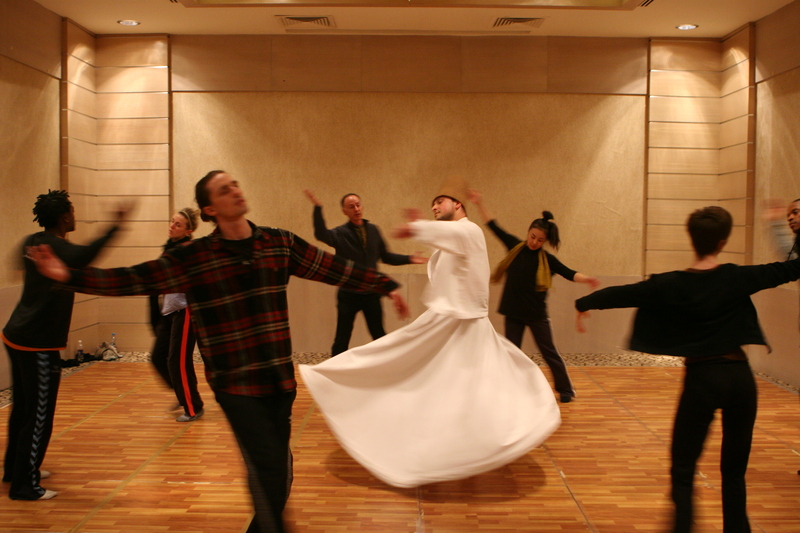 The need for this taking-stock was unusually important: based upon reaching a zone of comfort on both sides, a very large project is in the offing: the first-ever dance collaboration with the Konya Mevlana Order of Whirling Dervishes. We stayed in the very luxurious Dedeman Hotel, our generous hospitality sponsor here in Konya. We've rehearsed in one of the many ballrooms at this hotel which also serves as a convention center. Having painstakingly taped all of the seams of the parquet that the hotel laid on top of the carpet for our use (with sharp metal ridges that wouldn't have been noticed by ballroom dancing couples but which would have gouged the bare feet of our dancers), we rehearsed for several hours in preparation for Ahmet's arrival. We made some refinements to the hastily learned "Moonbeam"; and improvised to the Sufi mystic music on Ahmet's recordings. After having rested briefly, Ahmet arrived at the hotel and we discovered that the hotel staff, thinking that we had completed our work in the ballroom, had dismantled the parquet floor. Ouch!!! However, our intrepid gang came up with an alternative: having fully scoped out and made use of the commodious fitness center in the hotel, they pointed out that the squash court would do just as well as the ballroom, perhaps even better because of its wooden floor. I invite you to picture our "mystical" first showing of our work to this illustrious man in the squash court of a 5-star hotel, with sweaty hotel guests peering curiously through the glass barricade of the court! Actually, whatever happened in that court proved to be magical and the bond established in the earlier meetings was reinforced by what Ahmet perceived to be the lyricism, grace and common values of modern dancers from New York and Sufi's from Konya Turkey! The tables were turned and we were treated to our first live display of the Sema at their 2,800 seat Mevlana Center. Twenty-four dervishes bowed, strode forth into the huge circular arena and whirled in a lush display of flowing white robes, high tapered wool hats, arms either folded across the chest or extended with one slightly upwards (to God) and the other draped slightly downward (to Earth)with accompaniment by a similar number of musicians. 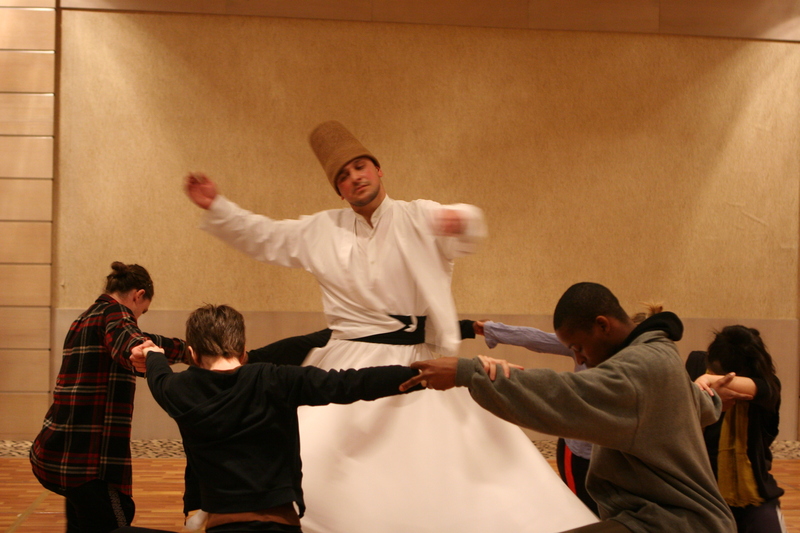 The ballroom at the Dedeman Hotel was once again equipped with a parquet floor, and we were joined for an afternoon session by Ahmet Calisir and his teenage son Taha and nephew Ebubekir, both of whom are members of the whirling dervishes. The moment had arrived for us to stop theorizing and get down to the business of experimenting with the blending of movements and the sharing of space between these two very different worlds. The dancers gamely followed the basic directions: always turn counterclockwise; always travel around the floor in a counterclockwise direction; always keep your left leg straight, as the pivot point as you step across with the right leg, your paddle, and the swivel on both legs. When in repose, cross right arm over left; when whirling, gently unfold the arms so that the right hand is up, the hand slight cupped; and the left hand bent at the wrist facing downwards. Ahmet watched patiently, every so often giving a gentle correction. His verdict at the end was that the dancers were all very talented and could master the whirling technique in a month or so if they persisted on their own. 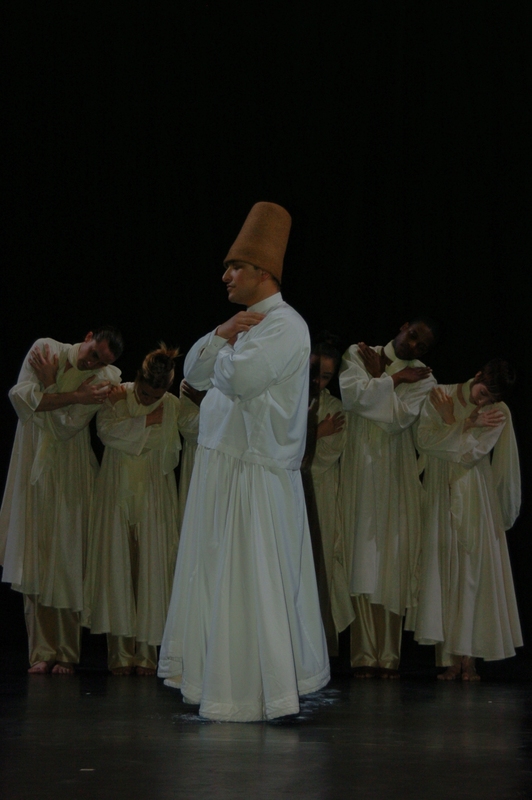 A beautiful moment occurred when Ebubekir, dressed in the Sema costume (white long full skirt; white long sleeved tunic; brown felt cylindrical cap) whirled in the middle of a tight circle made by the Battery Dancers who were improvising based on movements they had developed over the past several days. The simplicity of the juxtaposition was both striking and touching. Bafana, Robin, Paul, Sean, Adele and Mayuna all entered fully into the experience. Their facial expressions showed a tranquility (dare I say "spirituality"?) that seemed to be fed by the energy of the dervish in their midst. The harmony of those moments was complete. 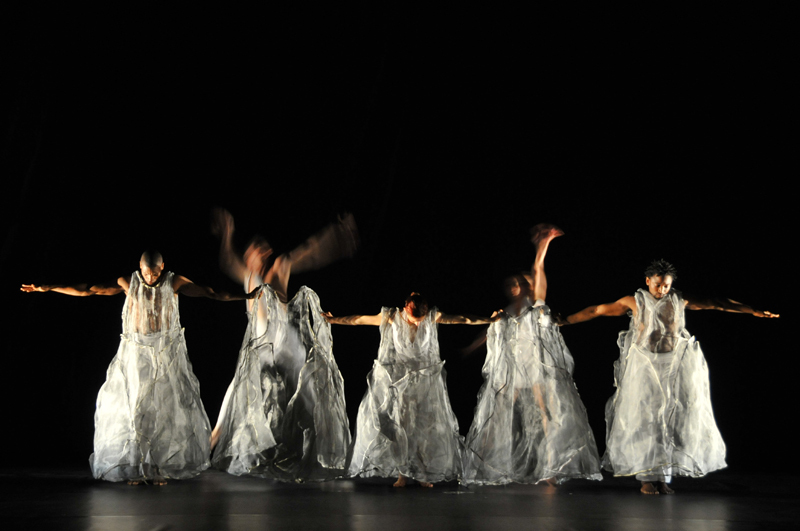 The Company’s program in Ankara centered around a performance and 4 workshops as part of the Middle Eastern Technical University or METU 10th Annual Dance Festival. 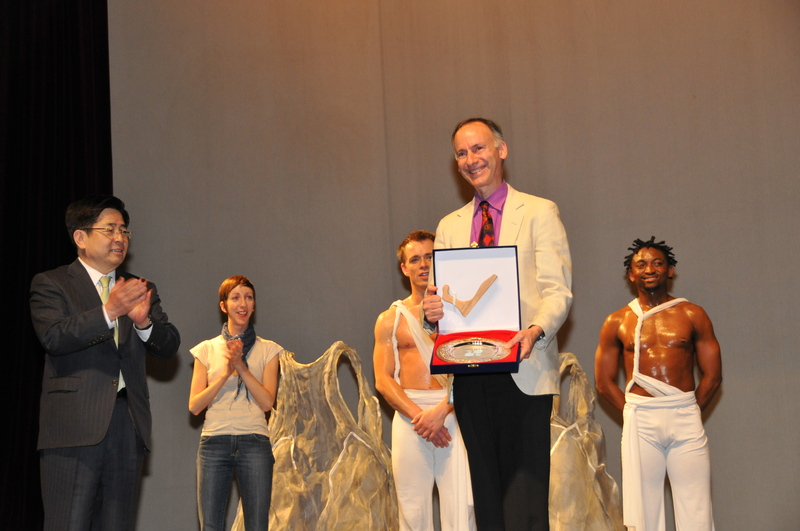 BDC was the first American company to participate in the METU Festival. Since the Festival draws freelance dancers, dance students and audiences from all over the country, BDC’s exposure and outreach was quite broad. Dancers from as far away as Istanbul attended the Company’s master classes. The Virtue of Patience: While delving deeply into cultural diplomacy, it is sometimes necessary to invest time and energy at a moderate pace that is at odds with one’s own. It is also important to validate the experience of nurturing relationships where the prospect of a tangible result lacks definition. During and soon after the Turkish program, we had hopes that there would be many follow-on activities. These have happened – Ahmet Calisir visited us in New York in 2008; we programmed Taha Calisir in a P.R. event for United Airlines at Newark Airport in 2012. However grander schemes have failed to materialize YET. We hope they will do so in the future, having created what we feel is a common ground with our Turkish counterparts. Be careful what you put into print: On a blog entry during our Turkish program, I mentioned that our dancer Bafana sang to accompany his warm-up on stage at METU because a boom box could not be obtained. A student from the university read the entry and was inflamed, taking from my casual words that I was criticizing the students. In actuality, my impression of the student volunteers who organized the festival was that they were phenomenally dedicated. We arrived in Ankara after having driven in two van-loads from Konya yesterday. We had bid a sad farewell in the early a.m. to Ahmet Calisir and our new friends at the Dedeman Hotel and then stopped off at the Seljuk University to pack the costumes and load up. We're now at the Sheraton in Ankara, a stunning hotel located half-way up a steep rise, looking out on a bank of houses stretching up the hill. I finally have an image to share from the Sema ritual in Konya. The blur of color does do a good job of conveying the aura that we felt at the time. I've also attached a photo of Shell Games that likewise has vapor trails. Battery's show at the University was very well attended (99% full, I'd say) and very warmly received. I spoke to some students at intermission, those who weren't too shy to venture a conversation in English. They had some fascinating comments about Shell Games; in fact, I thought they "got" the piece astonishingly close to my ideas about it. 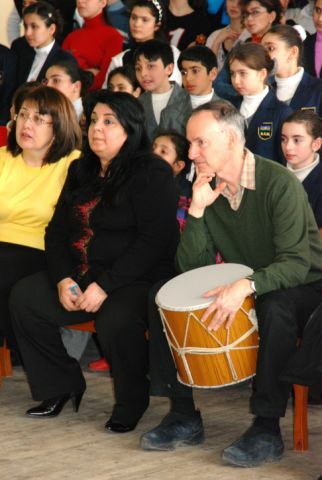 Moonbeam was dedicated to Ahmet, who sat with his nephew, in the second row. He said that he was deeply touched and that I have a big heart. Nothing could have been more gratifying to me. The dancers did a sensational job and who can say enough about Barry? He was working in a brand new theater (ours was the first theatrical performance given there) in which none of the equipment had been tested and only a couple of trained hands. Two English majors from the university were pressed into service – presumably as translators, but in reality, Barry put them to work as technicians, and wow, did they learn fast! Yesterday was a whirlwind day. Our masterful production designer Barry Steele had a challenge to beat all challenges: how to load in, hang and focus lights, prepare a video projector, hang scenery and train a crew in less than 12 hours (it usually takes about 20 before the curtain is ready to part!) When I entered the theater with the dancers in the mid-afternoon, I heard Barry's usual refrain: "I'm not ready; take your time warming up." Bafana, the warm-hearted clown of our company, is also the person who offered to give the company class. When he asked the crew for a boom box, the answer was "no", uttered so automatically and dryly that we thought it was a joke. But not so: no boom box. So Bafana in his charming off-key voice, sang the company through their barre and other warm up exercises. Meanwhile, the university students who run the METU / Middle Eastern Technical University (Turkey's MIT) ... were huddled in the lobby putting the finishing touches on the playbill for that evening's show. After having pitched in to help them, they were off on their labors of translating the whole thing into Turkish. As is almost always the case, the playbill got done just before the audience arrived; and things on stage got done too; well, sort of. The hall of 800 seats was filled to about 2/3 capacity --apparently twice as many as who had attended the previous night's show. There was surprisingly little diversity of age in the audience -- primarily college students and a smattering of teachers, Embassy staff and the odd senior dance fan! Each of the four dances received warm applause, though Shell Games and I'll Take You There were the crowd favorites. Our student guide Zeynap rushed the dancers into their clothes so that we could get to the nearby kabob house before closing. We downed our dinners in minutes flat and were back to the theater to pack up the costumes (still damp, a testament to the dancers' exertions). Several of the dancers had to wake up early the next morning to take the shuttle bus from our hotel back to the University campus in order to teach master classes. I hope that one of them will post a report soon on those activities: Instead of watching them myself, I spent most of the day in my room on the internet figuring out our return flights, due to the cancellation of our program in Armenia caused by the unrest there. Battery Dance Company worked here in June - July 2008. 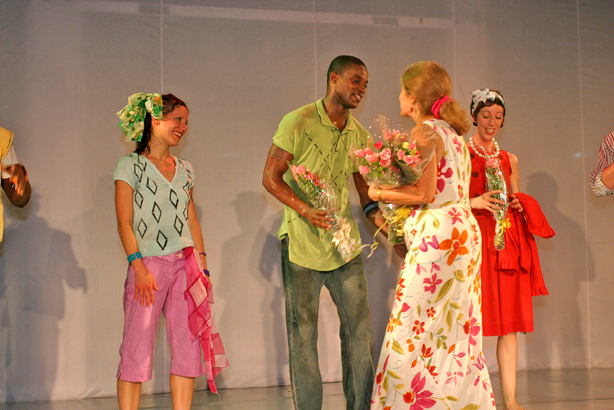 Professional modern dancers from New York City brought their art form to Germany in the summer of 2008. Whilst in Berlin, the company reached out to five schools in Berlin as part of the Dancing to Connect program. 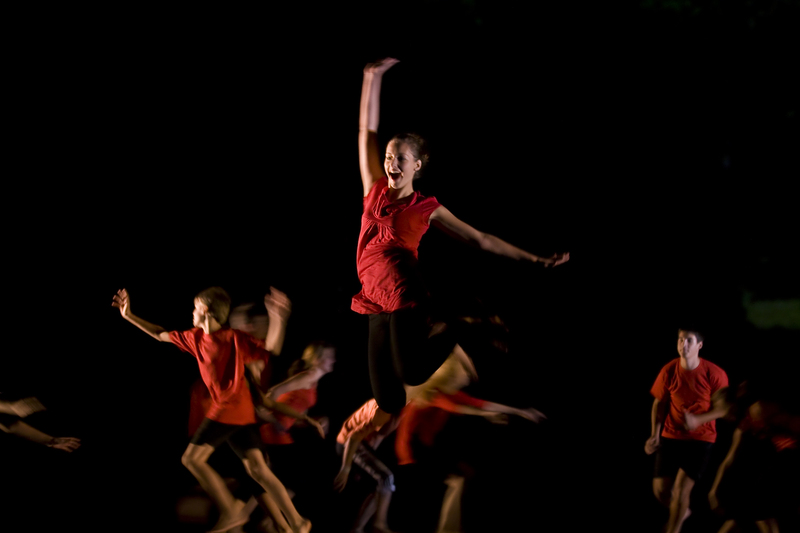 Dance is a universal language, and its appeal as a vehicle for self-expression has been demonstrated amply through earlier versions of the Dancing to Connect program during trips to Germany 2006 and 2007. 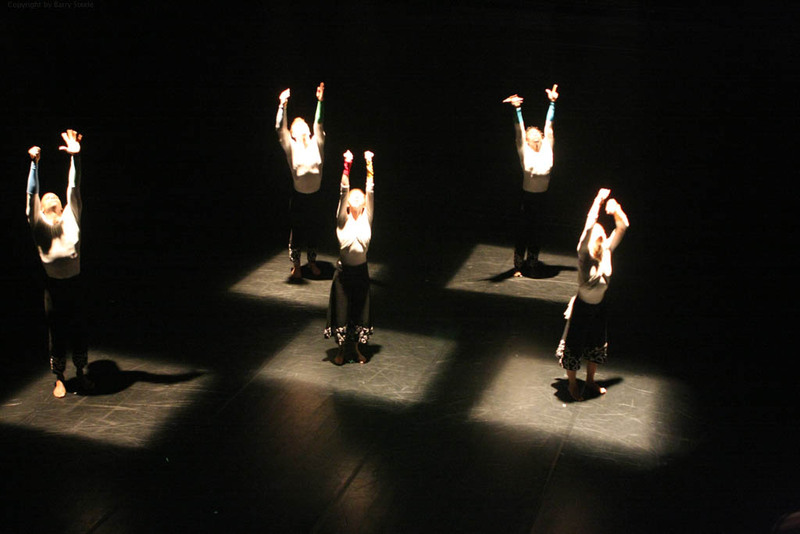 Following up on their successful experiment and having built international bridges between the U.S. and Germany through the art of dance, the American dancers significantly expanded their outreach in 2008. BDC's trip to Berlin was made possible through partnering with the U.S. Embassy in Berlin, U.S. Consulate General in Frankfurt, the City Governments of Stuttgart and Freiburg. The company recieved additional support from the Robert-Bosch-Stiftung, and Cerberus Deutschland among others. Throughout all of these programs, the thematic core of tolerance, integration and inter-cultural understanding is embedded into the choreography and addressed while building dance skills. The lingua franca (English) and the universal languages of dance and music build communicative bridges among students who represent diverse populations, immigrant and native, high-performing and educationally-challenged, Christian and Muslim. Likewise, the American professionals cross bridges in mentoring their youthful German charges. During the workshops in Berlin the students explored their own feelings and sensations, some new and surprising. They related to each other and to the teaching artists across generational, gender, ethnic, religious and social differences, converting their explorations into physical expression. The discovery of the self goes hand in hand with the discovery of the other. The workshop programs in Berlin culminated in a performance at the Haus der Berliner Festspiele (which co-presented the event) as part of the activities celebrating the opening of the new U.S. Embassy. Assistant Secretary Colleen Graffy provided a welcome address for the audience and Counselor for Public Affairs Helena Kane Finn congratulated the young performers and their families in German at reception following the performance.